November is coming to a close and the most magical month of the year is almost upon us. The first frost has caressed the early mornings and over the weekend Leo and I spent the most magical time having breakfast with Father Christmas. Every weekend at Brewers Fayre from the 5th December between 10am and 11.30am you can bring the kids along to your local venue to visit Santa’s Grotto, have a brilliant breakfast and meet the man in Red himself! If you can’t make it at the weekend, the lovely team at Brewers Fayre have persuaded him to stick around from Monday 21st to Thursday 24th December! The best bit is that Santa is bringing along lots of other activities for the kids to do whilst you’re at his grotto. 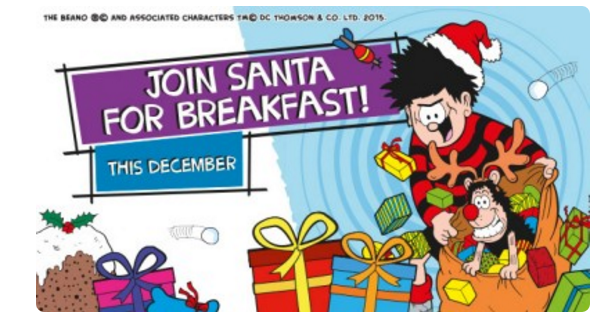 These include colouring in, creating Christmas cards and a FREE Beano comic. You can get all of this for just £8.99 per person! We traveled to the Guild, a local Brewers Fayre pub over in Bromsgrove early Saturday morning. Leo had been bouncing off the walls as soon as he woke up, he was going to see Santa bright and early, he was going to have a hearty breakfast and have such a super day! We turned Michael Buble up in the car, Jingle Bells rang out, we sang and the journey was over in the blink of an eye. We were welcomed by the very friendly (and festive) team and shown to our seats before Santa Clause appeared in his grotto as if by magic. Leo turned, his eyes widened and he couldn't get across the room quickly enough! He bounded straight over with the biggest smile on his face, and ran straight for Father Christmas. Santa took his time with Leo and asked him what he wanted this year, and Leo replied tat he wanted a blue racing car. He has been after one for months, in an ideal world he wants a electric sit and ride Mini Cooper so that he can be just like his Mummy! were invited to help ourself to the rather extensive buffet that was laid out. There were fresh pastries, and I couldn't help myself fast enough to one (or five) warm croissants and jam! Leo tucked into the ready supply of Cocoa Pops, and I finished up with a bowl of fruit salad before our cooked breakfasts arrived. Many activities had been laid out for the children from card making to being able to get their faces painted. Leo couldn't get into the play centre fast enough, and for the next hour I didn't see him! Leo had the most amazing morning and it was such a great experience for both Leo and I. The food was tasty, the service exceptional and the value for money is fantastic! Not to mention that Father Christmas is the REAL DEAL! If you are looking for a fun way to spend a morning, then I can highly recommend a breakfast with Santa at Brewers Fayre this December. Disclaimer: We were invited along to Brewers Fayre: The Guild and provided with complimentary breakfast and a magical meeting with Santa. All views and opinions expressed are completely honest and my own.